Do you like a good mystery as much as I do? I have always loved mysteries and whodunits. For years I was hooked on any bestselling fiction of this sort. I loved the intrigue, not figuring things out until the very end, guessing what was going to happen. Check out the latest whodunit, A Trail of Ink by Mel Starr. 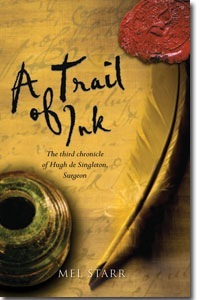 A Trail of Ink is the third chronicle of Hugh de Singleton, surgeon. One of the stolen books turns up alongside the drowned body of a poor Oxford scholar. Another accident? Hugh certainly doesn’t think so, but it will take all of his surgeon’s skills to prove. So begins another delightful and intriguing tale from the life of Hugh de Singleton, surgeon in the medieval village of Bampton. Masterfully researched by medieval scholar Mel Starr, the setting of the novel can be visited and recognized in modern-day England. Enjoy more of Hugh’s dry wit, romantic interests, evolving faith, and dogged determination as he pursues his third case as bailiff of Bampton. This book is a medieval whodunit and just in case you’re thinking this time period might not be for you, check out the glossary in the book! I love that the author has included this so that in case you don’t know what “braes” are, you can check the glossary to find out they’re medieval UNDERPANTS! Ha! Be sure to check out A Trail of Ink…and for all my Kindle buddies, you can get it in under a minute HERE. This book was provided to me free of charge in exchange for my honest review.